N6377 ‘Tiki’ flown by Kiwi pilot Harold Beamish, 3 Naval Squadron RNAS. Beamish scored his second through to 5th victories (out of 11 total victories) in this aircraft. 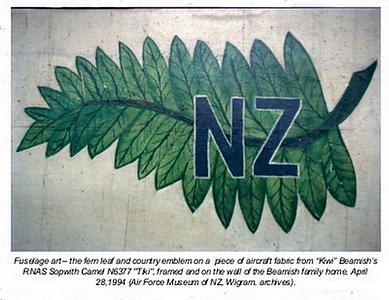 Poor 'Tiki' ended up on her back following a landing accident, but Beamish apparently took the panel with his fern leaf marking back home with him to New Zealand, where it was proudly displayed on the wall of his home. Photograph of the fern marking shows it looking quite different to the version in these decals, which also do not include the letters ‘NZ’. I suspect Avalon used Harry Dempsey’s artwork from Osprey’s Naval Aces of World War 1 for the fern. Beamish was New Zealand's last surviving WW1 fighter pilot, and passed away at the age of 90 in 1986. Note that the cowling, wheels and tail plane are painted blue – this is not particularly apparent in the artwork as it has been printed very dark and no colour call outs are included. B3781 supposedly flown by Canadian ace W.M. Alexander, 10 Naval Sqn RNAS. Note that B3781 was a Bentley engine Camel. Online research has produced further information regarding B3781: it was first delivered to 3 Naval Sqn on 10th July 1917. Flt Sub-Ltn AB Ellwood (later Air Marshal Sir Aubrey Elwood) was flying B3781 when he scored his first victory against a seaplane which crashed into the sea twenty miles off Ostend on July 27th 1917. This victory was shared with JST Fall, HF Beamish, JA Glen and LD Bawlf. Ellwood went on to score an eventual 10 victories, though not in B3781. Flight Sub-Lieutenant JWP Amos crashed B3781 on 23rd August 1917 near St Pol. After spending 2 months at the repair depot she was working again but didn't get back into service until 22nd December 1917 when she was issued to 9th Naval. 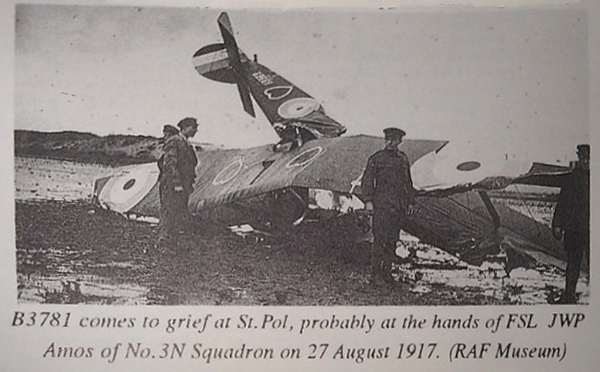 On the 3rd February 1918, while being flown by MA Harker shot down a Fokker Dr.I South West of Roulers. This victory was shared with B6430 flown by RR Winter. On 4th February B3781 was transferred to 10th Naval where it was repainted in the squadron’s striped ‘humbug’ markings. On 18th March 1918 it was being flown east of Roulers by Canadian FSLt Gordon Y Steeves and was lost over the Houthulst Forest. Steeves survived the crash and became a prisoner of war. Note the sheet doesn’t include the two additional hearts for the top wing on either side of the centre section. Alexander was not flying B3781 when he scored any of his 22 victories. 'On Nov 6th 1918 I carried out experiment of dropping a Camel from a Rigid Airship. 'My engine was started before leaving the ground and I kept it running at 500 revs. The Rigid Airship attained the height of 3000 ft. during which time the aeroplane was quite rigid and satisfactory. The saddle fitting over the after end of the fuselage was then removed. I gave the signal to be released and on being released the machine dropped about 10 ft and picked up her glide and was immediately under control. The machine showed no tendency whatever to get out of control. The speed of the Rigid Airship was 30 mph. “Sylvestre” Major E.L. Foote. This aircraft, B6398, saw plenty of action with No.1 (Naval) Sq., No.209 RAF, and No.201 RAF before it was relegated to No.10 Training Depot Station, Harling Road (Roudham). B6398 had been credited with scoring against at least 14 opponents while being flown by such pilots as Lt. Robert McLaughlin, Lieut. (A./Capt.) Wilfred ‘Wop’ May (his first 2 victories were scored flying this aircraft out of a total of 13), Flt.-Lieut. Samuel Marcus Kinkead R.N.A.S (6 victories in this aircraft out of a total of 35), and Lieut (T./Capt.) Reginald Carey Brenton Brading (4 victories in this aircraft from a total of 13). It was given the exotic ‘Egyptian’ markings (Cleopatra & and asp) depicted in this set after arriving at 10 TDS, sometime after 15 September 1918. Curiously, the serial number B6398 is not provided in the decal set but could be cobbled together from other serials in the set if the modeller had their heart set on it. 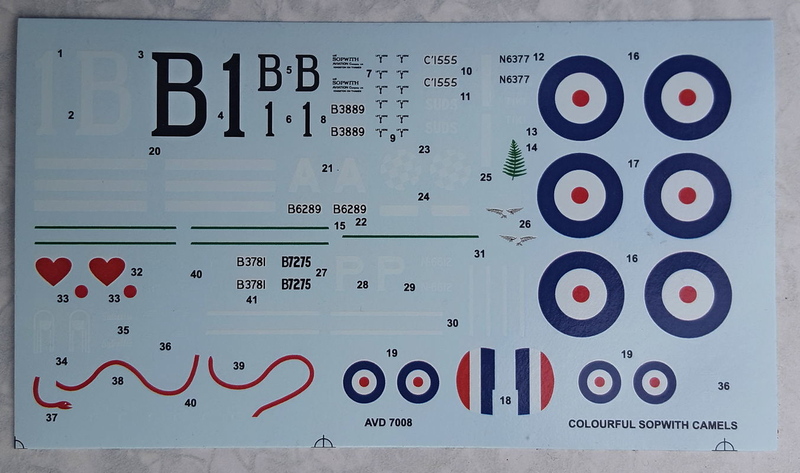 The colour profile from the decal set shows the blue as being very dark, whereas the photograph of B6398 in Datafile 26 has the same pale appearance as the blue stripe on the rudder. Clerget B3889 “B1” flown by New Zealander Clive F Collett, B Flight, 70 Sqn RFC. Wingnut Wings Clerget-engined Camel includes these markings and the colour instructions note that photos of other 70 Squadron Camels show that the fuselage ply panelling , fin, wheels and cowlings were overpainted in a dark colour, probably a gloss enamel paint version of PC10. Collett scored five victories in this aircraft out of a total of 12. According to James McCudden, Collett "used to come back shot to ribbons nearly every time he went out. One day he drove a German machine down to the ground behind the German lines, and then to make quite sure he fired at it on the ground until it burst into flames. Collett was always for downing the Hun, whenever and wherever he could find him." Collett drowned in the River Forth when he crashed while flying a captured Albatros. McCudden believed "something flew off the bonnet of the engine and stunned him, for he was seen to dive straight into the water without attempting to recover himself." Le Rhone C1555 “Suds” F.L. Luxmore & S.P. Gamon 78 Home Defense Sqn RFC. One of the more colourful Camels, finished in a pale blue. Avalon’s profile does not show the navigation lights & landing flares which were fitted, and painted prop also not shown. Wingnut Wings included this aircraft in their Le Rhone version of the Camel and more information (including details of the landing flares and navigation lights) can be found on their website. B6289 H.L.Nelson, W.M.Alexander, A Flight, 10 Naval Squadron RNAS. Wingnut Wings included this aircraft as one of the five options in their Clerget engine Camel kit. 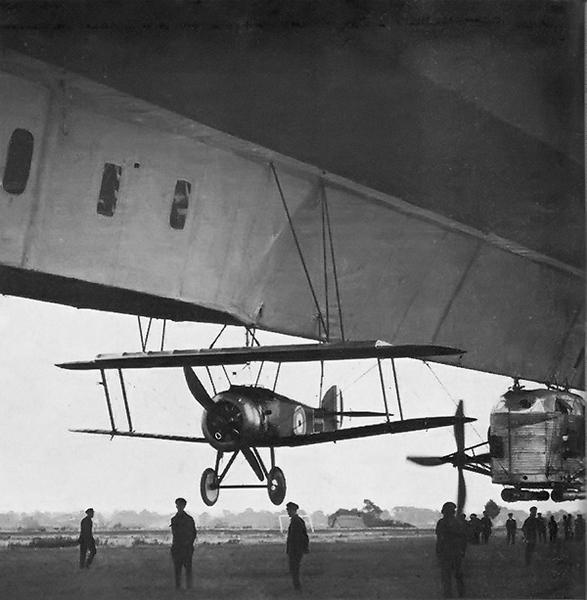 Historical details from their instruction booklet: B6289 was a Sopwith-built Camel, delivered to 10(N) Squadron in September 1917 and painted in the striking black and white striped cowlings associated with “A” Flight. Although B6289 is frequently illustrated with a star on its wheels, only small black and white checkers are seen in the photos available to us (WNW). The Sopwith factory(?) applied PC12 finish on the fuselage has been overpainted, almost certainly with a shade of PC12 (or 12) that would not match the wings. 8 new markings options for Camels. Yay! Particularly useful for Roden kits whose decals can be difficult to use. The profiles lack colour callouts which would have helped modellers with some of the more unusual finishes. No references to help modellers who might be interested in knowing the history of the aircraft or pilots. Decal manufacturers Pheon and Aviattic have raised the bar for other decal manufacturers with their research. 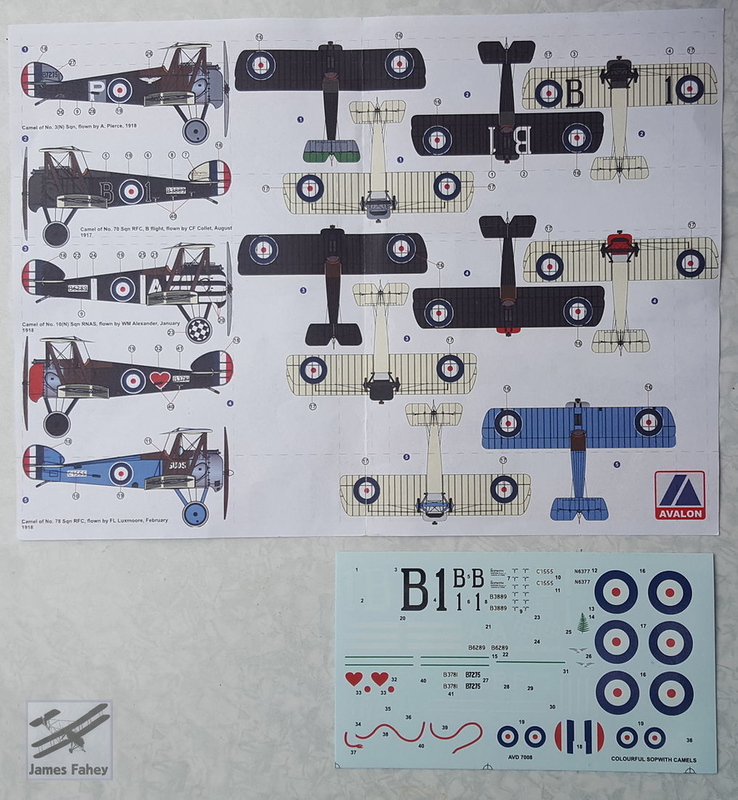 Fortunately Wingnut Wings have produced four of these markings for their 1/32 kits and their website has plenty of reference information. 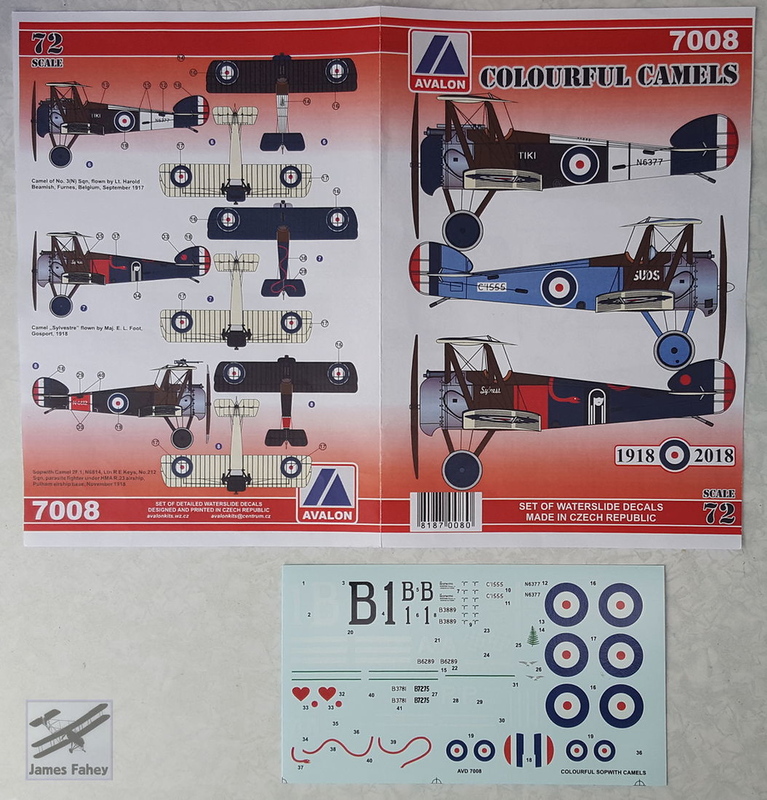 News of further releases found on the internet: after the release of Camel decals in 1/72 scale Avalon will be releasing Colourful Camels in 1/48 and are working on 1/32 scale decal sheet. Other topics may include British Nieuports, R. E. 8 and F.2B in post war service.